Um .....no. Stating his/her own experience---fine. Judging another nurse---not fine at all Stating ( judging) that if a nurse has to cry in her car , she needs a career change? Where do you see that bringing "some positivity into this thread"? No, I get it about opened food. But what about for example those prepackaged containers of applesauce or pudding--completely sealed, no refridge required? When those are on the pt trays, they also have no idea who has coughed etc on the containers. Actually I was thinking about donations to food banks, shelters. What actually happens to it? I'm talking about the prepackaged fruits, puddings, applesauces, juices etc not opened foods. I see mountains of this go back to dietarty. Does it get thrown away if it's not from an isolation room? Actually I'm sure it all gets thrown away but is there a reason to throw unopened prepackaged non-isolation room food away? I think about the waste if it is tossed and hungry people in shelters and get sad. Anybody know? who does rn refresher besides PHES? I understand what that nurse was telling you. I don't totally agree, though. I took a refresher course last Jan after a 16 yr break from the hospital. I did do some home health about 8 years ago but that's all. I initially couldn't get into a hospital job so I took a private duty vent case. And kept applying at hospitals. I was finally accepted into an internship at Dallas Presby and am now working full time on an oncology floor. Is it a tough market? You bet. Is it impossible? No way. Best of luck to you. Worst I ever saw was over 20 years ago. It still haunts me. 13 yo girl came in to ED on Halloween night. Mom and Dad let older sister go to Halloween party but not her. So during day she OD'd on allergy medicine--I think Primatene. Of course, only best friend knew and both were scared to tell. Eventually she got sick enough and told. She was already in renal failure when she came in. She was crying and holding her mom and saying please, I don't want to die. She coded within 10 minutes and couldn't recover. I tell this story as often as I can when appropiate to kids. Drugs-any drugs- are not to be messed with. I will never forget that little girl. Run, run, run! I tell you this as an former private duty nurse. You do not want to be associated with this agency or this case. I understand wanting a paycheck--any paycheck. But with this paycheck you are jeopardizing your license(not to mention your sanity) . You didn't work so hard in school to risk it like this. Run! Nurse ABC This is a little awkard to talk about but it's almost as if our roles are reversed. I need to let you know that nurse educator expects you to be doing all the pt care with me as a backup only. I know you know how to do pt care but----what can you do? you know how it is with management rules. yada-yada-yada Blame it on protocal, orientation guidelines, etc but get her to switch roles. Maybe she doesn't understand what is expected of her and will appreciate the clarification. Or maybe she's looking for an "easy ride" for the next 2 weeks. as an older rn returning to the hospital setting after a 16 year lapse of hospital care, i feel like i might have some input about this situation. obviously, i'm not in your there so i don't know all the details. but have you tried being more direct with her? why didn't you palpate the abdomen? we consider that part of our routine assessment esp for abd pain--then does she do it next time? if not, why? when you shrug your shoulders when i ask you*abc*, i get confused. does that mean you agree with me or you don't understand or you'd rather hear anyone but me talking right now or.....? sounds like asking open questions like how do you think you're doing may not be focused enough. if it doesn't work, at least you've got material to document to cya depending on where she's coming from, she can be having a steep learning curve just acclimating to computer charting and such. 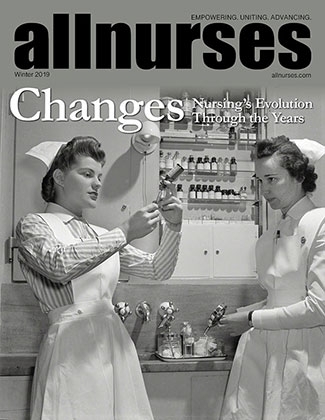 remember, computer charting hasn't been around forever--just since you younger nurses have been around. maybe it might help if someone her age that she might be able to relate more to helped with orientation? i read a lot about how new young rns get scared and overwhelmed and self-doubting. i'm here to say that it also happens to older nurses in new learning situations too. i know you're helping her with orientation not actually precepting her as in an internship. but it sounds like a direct talk might be in order--with her and/or the nurse manager. good luck to you both. .